If language is sound, and sound is music, well then that sounds like music is language. But if music is sound, and sound is language, then that means language is music. That logic brings your attention to the similarities between learning music and learning language, right? Because when you think about it, most people find learning music much less intimidating than learning a new language. In fact, why are we not all learning foreign languages through songs rather than sounds?! But if such logic is sound, is it sound enough to grow a profitable online language business on? Actually, it definitely takes more than clever lyrics to make an info-product venture succeed. You also need a powerful content creation toolkit to build, ship and promote your virtual language courses without having to spend a small fortune to get it all started. 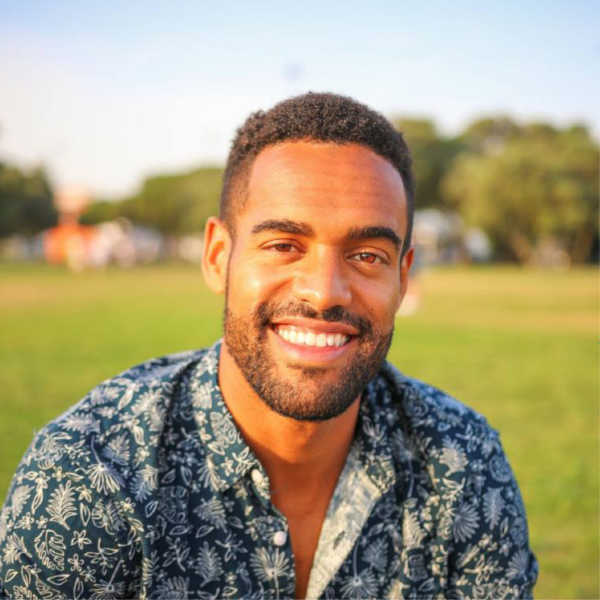 Read on to see how one linguistic solopreneur bootstraped a mid-six-figure business by using Thrive Architect in just a few short years. That musically talented polyglot in the video is Idahosa Ness, founder of the online pronunciation and phonetics language school known as The Mimic Method. 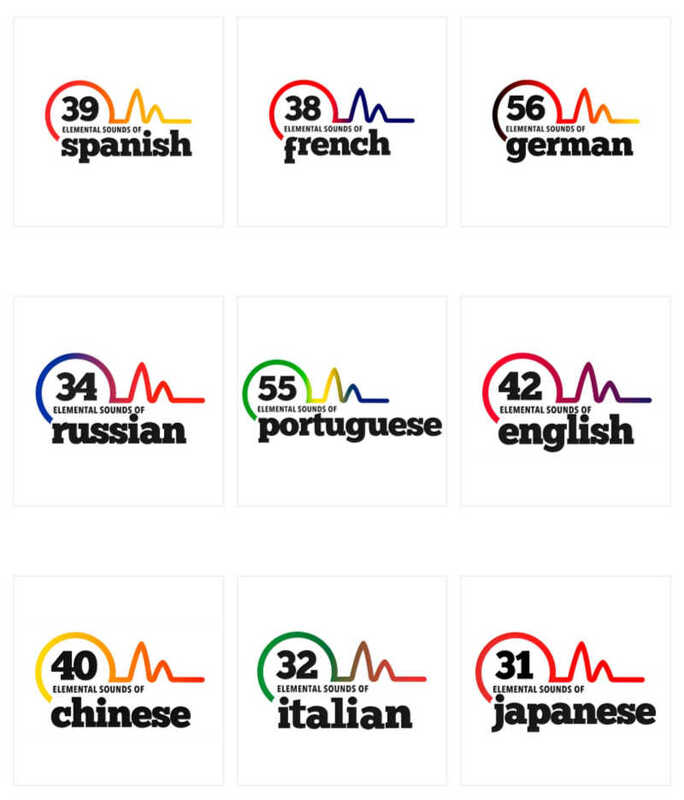 He created it to help himself learn multiple languages — and sound like a native speaker in all of them! He’s now fluent in six languages and counting. Idahosa offers The Mimic Method for 10 different languages on his language school website. If you're wondering why it's 10 and not 9, there's 2 different courses for Portuguese (Brazilian and European Portuguese). Where most language acquisition approaches begin by teaching reading and writing, The Mimic Method does the exact opposite. Idahosa’s students master hearing and pronunciation skills first so their ears, mouth and brain can pick up the sounds, rhythms and connections of the language they're trying to learn. The Mimic Method helps students pick up new words and expressions “by ear” so they can then listen to native speakers and then accurately mimic the sounds they hear. His online training programs have been so successful that over 5,000 students in the past 3 years have bought and studied them — many of whom returned to purchase a course in a different language later on! Idahosa's first iteration of his Mimic Method homepage (built with Weebly) circa 2012 pulled from the Wayback Machine internet archives. Although Weebly had a visual drag & drop builder to create the website with, Idahosa soon found that he couldn’t create the Ecourse products he wanted to with it. Of course such mass-marketed solutions are easy to get websites started with, but soon become inadequate for building solid online businesses on. Eventually, someone recommended that he switch from Weebly to WordPress and try using the Thrive Themes plugins to build his business with instead. Idahosa's current "Method" cornerstone page built with Thrive Architect. At first, Idahosa felt overwhelmed by the learning curve of WordPress. There were several new self-hosted tools and tasks to grasp compared to Weebly. However, because Thrive Architect’s What You See Is What You Get (WYSIWYG) content builder was intuitive and provided the same kind of drag & drop environment, he quickly got the hang of it. Not only could Idahosa customize his site exactly as he needed to with Thrive Architect, its professionally-designed landing page templates significantly reduced his new landing page production times. As you’ll soon see, Thrive Architect became Idahosa’s secret weapon. He was able to grow his business by shipping great content faster rather than wasting time deliberating on design details that didn’t matter. Need to build and ship something like an Ecourse for your online business? Take a leaf from Idahosa's business and understand that you don't need to re-invent the wheel each time you create new pages for your website. Especially for the first iteration of a landing page, it's okay to use professional designed templates to knock out ship-worthy results fast. Just iteratively improve on whatever design you ship with A/B tests to steadily boost your conversion rates over time. When Idahosa was creating his latest batch of premium online courses called "The Elemental Sounds Master Classes," he found himself scratching his head wondering how to design a decent course quickly and cost effectively. I promised our customers I would make this course in all 10 of the languages offered, but I had not decided how I was going to quickly deliver these courses without the use of custom — and expensive — outside contractors and services. But one day, as Idahosa was designing a new landing page for his website with Thrive Architect, the idea hit him to just use its templates to fascilitate the course creation process. 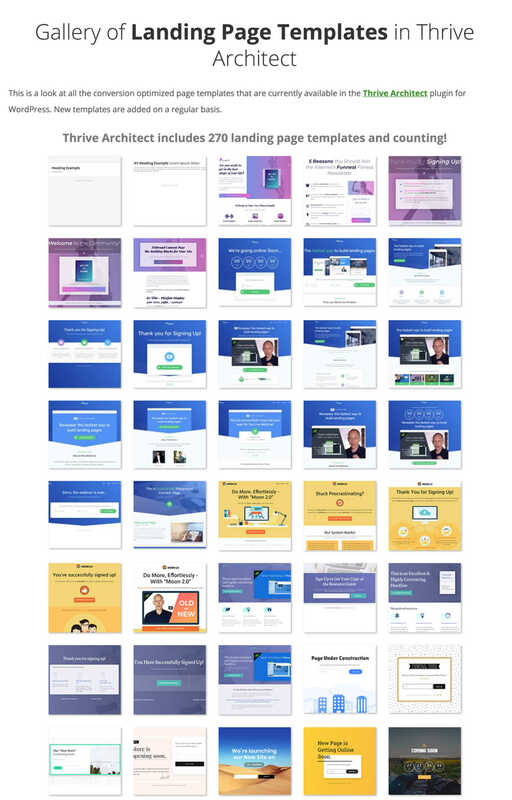 This image gives you a small taste of the 270+ professionally-designed landing page templates Thrive Architect has to offer. I ended up creating over 1,000 pages on The Mimic Method website all using Thrive Architect. I was able to get all 10 of the new courses built and launched in under 6 months. They all currently operate as my flagship products. Because Idahosa already used Infusionsoft for his Customer Relationship Management (CRM), email marketing, and payment gateway needs, he only required an additional plugin integration with Memberium to limit access to his Ecourses. The Memberium plugin allows him to group lesson pages into unique Ecourses and lock away page content to non-paying visitors based on tags in Infusionsoft. With the membership website functionality added, Idahosa’s 10 “Elemental Sounds Master Classes” were launch ready. Like most online businesses out there, overnight success is not the norm. It takes a few years of consistent progress and learning from your mistakes to build a sustainable business. Idahosa’s Mimic Method education venture was no different. In fact, if you’ve read any of our past Thrive Themes customer case studies (here's the links to Louise’s story, Aja’s story, and Brad’s story), you’ll see that slow, consistent growth should be expected for any solopreneur just getting started. Although it didn’t take him very long to see a little profit, it did take a few years of trial and error to reach a point of significant profit and automation in The Mimic Method business. Annual product launches and new automation sequences produced occasional jumps in revenue that became very satisfying entrepreneurial milestones. Idahosa also found that leveraging the power of scarcity marketing by using the Thrive Ultimatum plugin helped boost sales during each of his product launches. 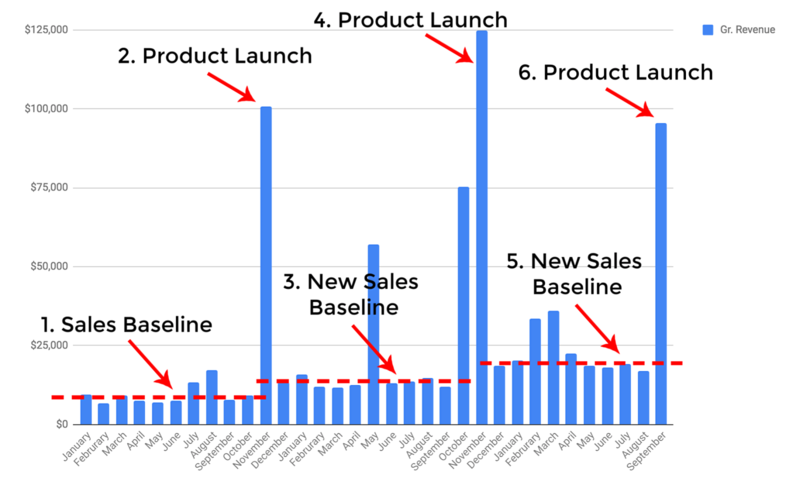 To show you just how powerful those product launches were to The Mimic Method's growth — both during launches and in the months after — check out the revenue chart below. A gross revenue chart showing the steady growth of Idahosa's Mimic Method online business from January 2016 to September 2018. Notice the spikes monthly in revenue during product launches followed by a new baselines to monthly revenue. Four years after Idahosa began, The Mimic Method finally grew to become a mid six-figure business ($300k to $400k annual revenue), with a team of 3 employees and some additional freelance help. Part of Idahosa's success in selling Ecourses comes from learning how to prepare and execute product launches as well as grow an engaged email list. The current Mimic Method email list has around 30,000 contacts, with weekly increases of ~300 contacts. Course sales are currently in the ~25 products per week range. The Mimic Method Screen Filler Lightbox 2-Step Lead Magnet modified from the Thrive Leads opt-in form template shown below. By only changing the copy and button links, Idahosa was able to launch a high-converting lead generation form in minutes. What's even better is that Idahosa's list is super engaged. He thinks that's due to all the effort spent ensuring each and every email sent out is packed full of value for the readers. Of course, all email lists start at zero subscribers and the big growth bumps of The Mimic Method list coincided with each new product launch. In fact, the lead generation growth curve mirrored the sales curve shown earlier (subscriber spikes after product launches followed by an increased subscription baselines). In addition to product launches, Idahosa said the other email list growth factor for his list came from affiliate marketing efforts. Specifically, partnering and collaborating with other traffic heavy sites that helped boost The Mimic Method's exposure to more readers and potential customers. Creating new content in the form of online courses, blog posts, lead generation funnels and sales funnels has been key to Idahosa’s success. When you create 1000+ pages for 10 different paid Ecourse products, as well as 100+ blog posts to promote your site with, you must have a solid content creation system to pull that off. First, Idahosa and team identify new content opportunities through Keyword Research, their readers' blog post comments and customer feedback about Ecourses. Idahosa then asks his in-house and freelance writers to create specialty blog posts to get new content to the 80% complete mark. 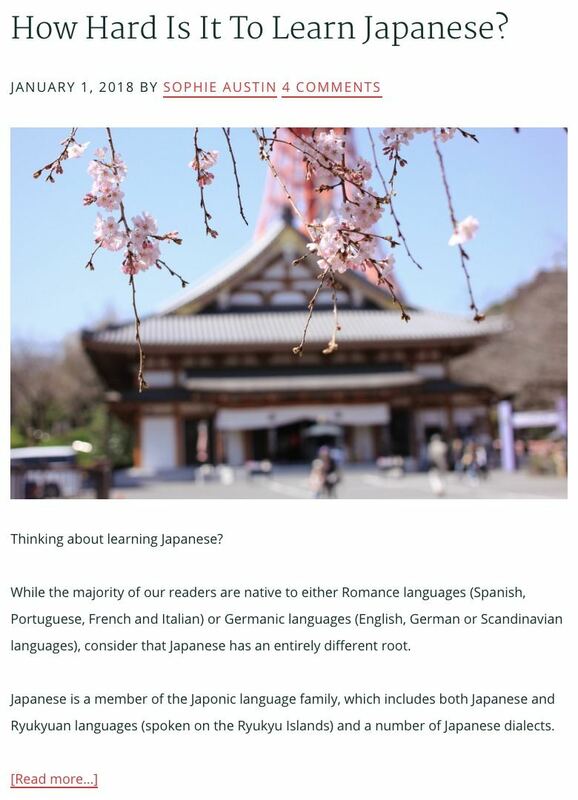 A screenshot from The Mimic Method blog reel showing an article about "How Hard Is It To Learn Japanese?" After that, any multimedia materials needed within new posts (primarily audio and image files) are outsourced to freelance designers. The in-house team will also design and build new lead magnets when needed for posts. Finally, blog posts go to Idahosa for a round of edits. He then sends updated articles back to the team so they can build the publish ready version with Thrive Architect. Idahosa uses both Thrive Leads and Thrive Architect templates to produce lead generation forms and landing pages for The Mimic Method website. He relies heavily on Rapid Landing Page Principles to quickly create any page or funnel needed for the site. That means keeping the pre-designed structure of most opt-in form and landing page templates and simply editing the copy, media, and branding colors to match the look and feel of The Mimic Method website. To give you an idea of how fast — and successful — modifying a Thrive Leads template can be, take a look at the Thrive Leads template Idahosa used (shown below) to create the actual screen filler lightbox he's currently using to convert visitors at 15% (shown above). A Thrive Leads Screen Filler Lightbox 2-Step opt-in form template. 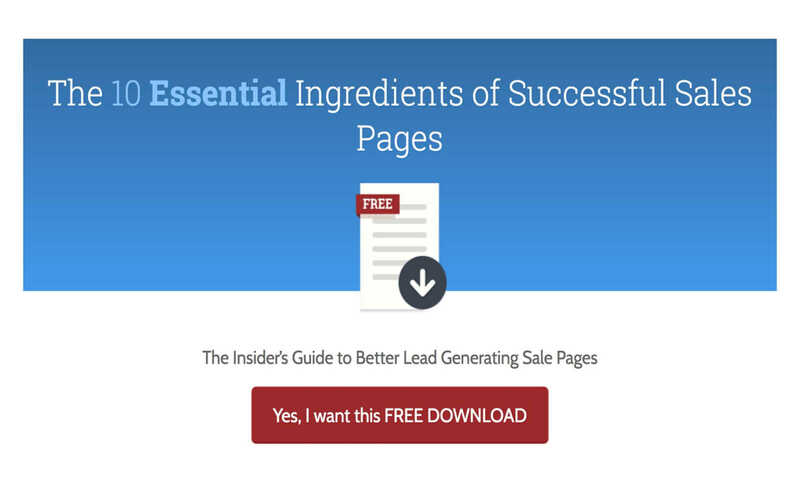 The lead generation form is then linked to Infusionsoft where it can trigger the delivery of the PDF or a completely automated multi-email sales sequence. Finally, Idahosa is always trying to increase his conversions through consistent A/B testing. When it comes to lead generation, a Thrive Leads A/B test is always run whenever a new opt-in form is launched. Idahosa lets the campaign run for a few weeks and then checks the test to make sure it's achieved statistical significance before picking a winner. He then has his team rinse and repeat that A/B testing process a few more times to try and achieve the best conversion rate possible. To try and boost the traffic to those tests, a range of strategies are employed including content marketing on The Mimic Method Blog, posting on social media, and creating Search Engine Optimized (SEO) articles to capture more organic traffic. To date, very few paid traffic strategies have been used — just in case you were wondering. However, Idahosa and his team found that creating guest content for other websites that aligned well with the foreign language learning niche gives a great low investment, high reward boost their business. For example, recording podcasts with travel bloggers and publishing guest posts on other language blogs are usually profitable traffic boosting activities. Although it's good to be swift and efficient, be extra-sensitive to the details. For example, during one of Idahosa’s product launches, he accidentally sent a sales email out to his list with the wrong contact email address. Just imagine how awkward it was responding to — let alone trying to sell to — over 30,000 people who noticed that. Automate and systematize as much as possible. Idahosa says his biggest wins came from getting his online business to a point of pure automation. When working, Idahosa always asks himself “How can I effectively systematize and outsource this?" to help grow the business instead of constantly putting out fires. Grab a Template, Make Some Modifications and Ship It! By far, the biggest lesson to take away from Idahosa’s story is how powerful the Thrive Architect landing page templates are for shipping high-quality info-products rapidly. In fact, I'd bet money you can apply that competitive advantage to your own business if you gave it a try... so why not take a crack at it right now? If you don't have a lead magnet up and running yet on your website, I challenge you to pick a Thrive Architect lead gen template set and ship a list building funnel over the next 48 hours! If you have any questions, comments or thoughts about Idahosa’s business journey or rapid implementation strategies, make sure to post your comment down below! 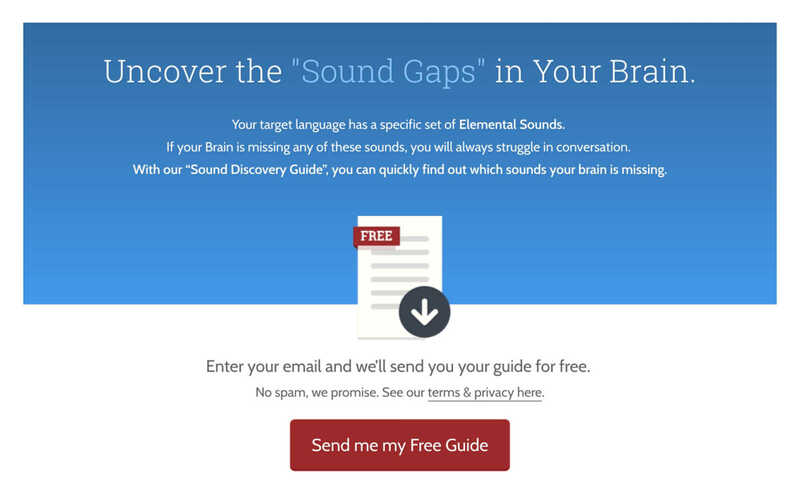 What an awesome case study…I was one of those who “thought” I had to build from scratch. I just built a 7-lesson SocialSnak™ Challenge, starting with the KnowHow templates. Loved it! Thanks for all the great articles Matt. Looks like your online business just got supercharged with a new ship-fast competitive advantage! Tick-tock, tick-tock…best of luck getting your list building funnel shipped this weekend! Lenny Kravitz looks so young in that video. I didn’t realize he had such humble beginnings. As for a Plugin or Software Company landing page template, it’s not really a good use of our resources since most programers like to code their own sites and pages. Unfortunately, it wouldn’t really help our target customers if we did that, but I’ll definitely pass your idea along to the team! Not sure if this was intentional or not, but landing page you state as — “Idahosa’s current Mimic Method homepage built with Thrive Architect.” — is absolutely not a Thrive Architect theme or template. That page is on the Genesis Framework and is using the Maker Pro theme from StudioPress. The source code for the page clearly states this. I am a fan of the Thrive Architect so I hope this was just an oversight. Thanks for your comment Jonny. This was an oversight on my part about the current homepage being built with Thrive Architect. I’ve updated the article to showcase the cornerstone “Method” page instead, which is built with Thrive Architect. Thanks again for calling me on my mistake so I could correct it! Hi Olga. Consistently publishing content is definitely good for SEO so make sure that you do your best to stick to a consistent blog post publishing schedule if you want to get the most out of your content marketing! Great article, great story! I would love to give some of Idahosa’s courses a try at some point, but at the moment I’m actually in the process of fleshing out an idea for my own online course, so this was super timely information! One question – wondering if anyone has any opinions/experiences/recommendations (for or against), on membership plugins for WordPress. I’m still early in the process, so that’s a bridge I haven’t crossed yet (as far as investigating options), but would love some insights on what to look for, or even which ones I should avoid. We have used Memberpress for around three years now after a lot of research. It was lucky that our recent adoption of Thrive Apprentice meant that our choice can be used to control access to our courses. Some membership plugins we tried caused conflicts with our Thrive products, but Memberpress has not given us any such problems. Hi Kendrick, thanks for your comments. As for membership plugins, we’ve tested several of them in the past few years and have always run into problems with each of them. Unfortunately, the real strengths and weaknesses of a membership solution only reveal themselves in real world use, when it’s basically too late to change your mind and switch to something else. Because of this, we can’t make a recommendation for any solution with confidence and don’t really see a way of thoroughly testing all the available solutions out there right now either. We are working on a solution for Thrive Apprentice at the moment, but I can’t give any details on when that will be available. Is the course content on a set of web pages rather than an LMS or Thrive Apprentice? If so, that’s genius. I’m gonna try that! Yes, Idahosa built each course with multiple Thrive Architect landing pages. He then used the Memberium plugin to lock the course content off to paying members only. At the moment, Thrive Apprentice can only be used to build lead magnet style free Ecourses, but we’re working to give it paid membership functionality soon. Until then, you’ll need to use a solution like Idahosa currently has (Thrive Architect Landing Pages + WordPress Membership Site Plugin) if you want to charge for your Ecourses. Hi Kendrick, I can’t speak to when we’ll have a solution available for Thrive Apprentice, but we are working on it. Thanks again for your comments! Hmmm..this is yet another actionable piece of content! Thank you matt for this. Glad to hear this one was really useful for you Michael! This is so pertinent since I’m also working on my own courses… BIG question: I was going to use Thrive Apprentice — behind a Membership plugin to protect course content — but I’m very interested in hearing more detail about how & WHY Idahosa chose to use landing pages for his course content (if I read your article correctly). I’m with you Karen. It would be useful to get a screen shot and/or more info about how the course content looks and is set up using Thrive Architect / landing pages. I think Idahosa chose to use landing page templates for his course content because of the speed in which he could deliver them and the complete customization control Thrive Architect offers for each lesson page. Also, I’m not exactly sure on the timing of Idahosa’s first Thrive Architect built Ecourse launch, but it was likely before Thrive Apprentice was even available to our Thrive Members. Fabulous post Matt! One question, in my Thrive architect all those templates don’t come up, only some of them. Where do I get them? Do I have to import them from somewhere? Hi Maggie, try doing a hard refresh by hitting CRTL+F5 (or CMD+F5 if you’re on Mac) this is to clear cache. 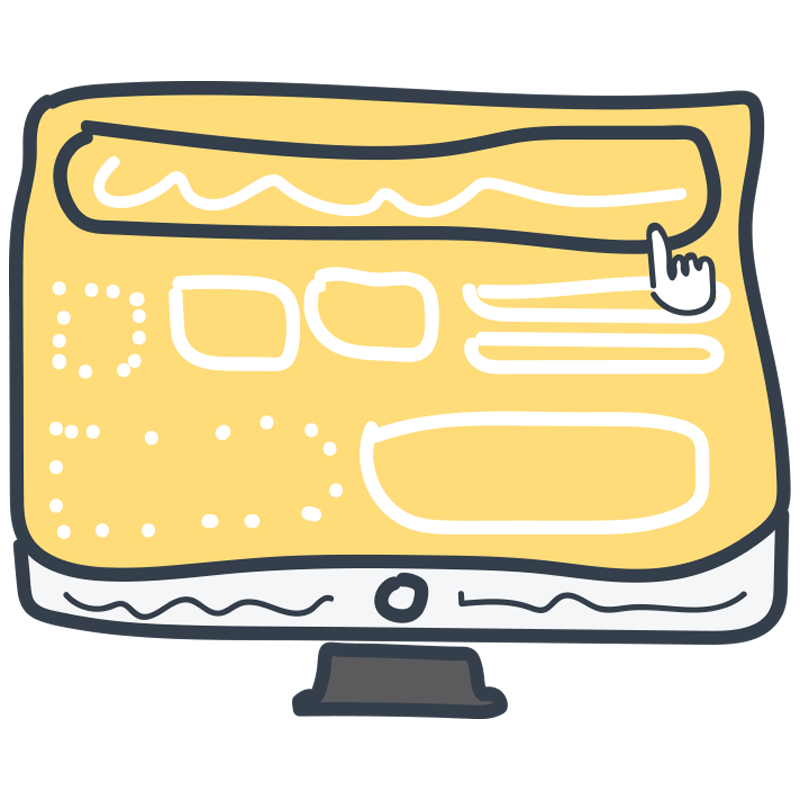 If you’re still not seeing all the landing page sets, you can ask our support team to help you out on the forum. Thanks for your comment Maggie! Nice Article,Hope you update regularly for Beginners.Thanks In Advance. Amazing and inspirational. Been thinking about creating my own ecourse and this gives me some ideas. Thanks for sharing Matt. Cheers Victor…good luck putting your own Ecourse together! As for a membership from scratch course, it’s hard for us to build something like that at the moment since we can’t really recommend a good membership plugin for WordPress at the moment. We’ve tested several of them in the past few years and have always run into problems with each of them. We are working on a solution for Thrive Apprentice at the moment, but I can’t give any details on when that will be available. When it is released however, we likely will put a course together showing Thrive Themes users how to build a membership site from scratch. I have been waiting patiently for the paid membership plugin from Thrive :) It is going to be very well received! So do you need a theme to use the templates? I love the chic templates but use them on Rise. Is there an easier way to do this? Also off topic but how do you standardize the fonts you want? Thrive Architect templates can be used with any WordPress template you have installed on your website. The Thrive Architect template simply overrides the theme for that landing page. As for fonts, you can change your default font styles in the Thrive Architect page settings for each landing page you create. You can learn exactly how to do that by reading this knowledge base article. It is undoubtedly a great post for the bloggers and web designers. Without doing much effort, one can create a wonderful homepage by using Thrive Architect Templates. I am a newbie in the field but I will surely try these templates in the future for my upcoming venture. The most amazing part is that you can easily set-up all the videos on homepage of the website. You are truly an inspiration for all of us. Keep sharing such kind of stuffs on a regular basis. It will help us a lot. 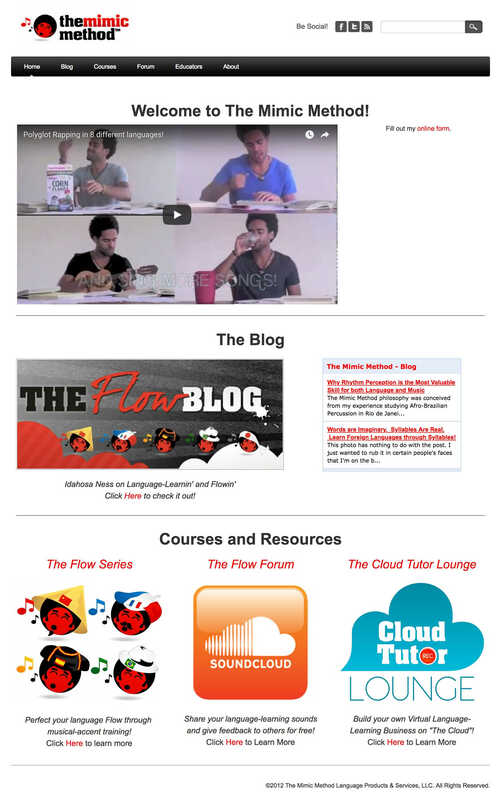 Also, thank you so much for sharing detailed information about creating an E-course business. Thanks Raj…more great content and case studies coming your way! This is intriguing. Would this replace Teachable or Thinkific? The ‘mention’ of Infusionsoft gives me a panic attack. It’s no small product to implement never mind it’s pricey! If that’s essential to success with this, it’s important people are aware of it.